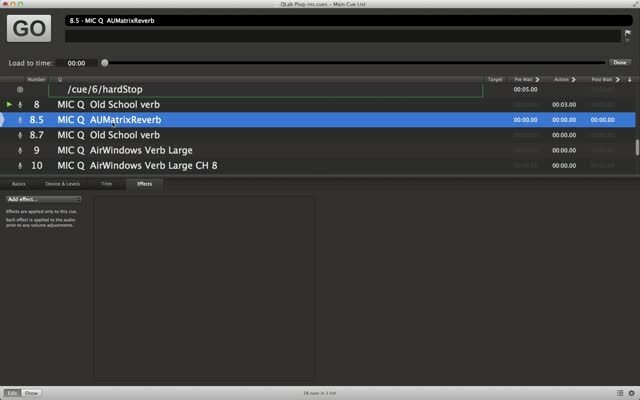 EXAMPLE 6: STOP with REVERB TAIL Using AUMatrixReverb. The main cue has a little reverb applied, otherwise, the contrast with the tail section can be too great. When the STOP AND REVERB cue is triggered the original cue is stopped and a fade cue snaps up the wet mix of the reverb rapidly. 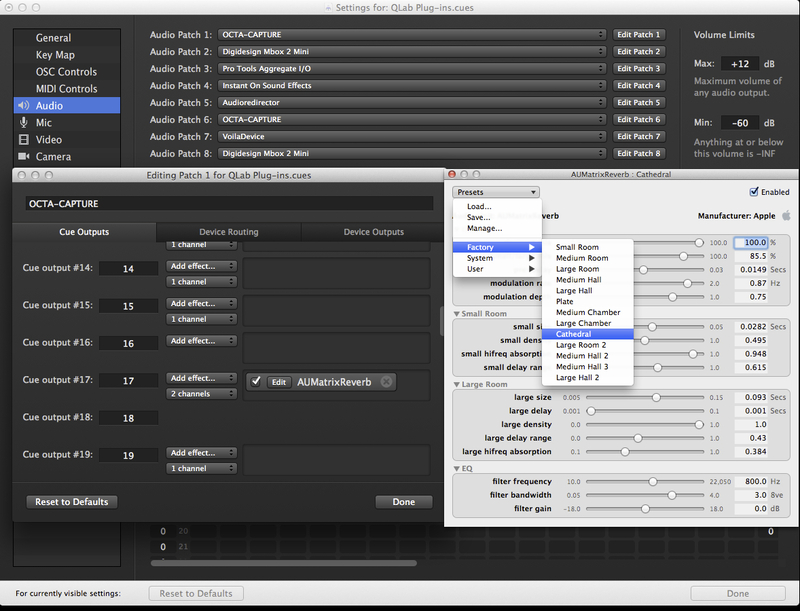 This utilizes the feature of the fade cue that allows all parameters of plug-ins to be changed from the original value to another in the time of the fade. Finally, the cue is manually hard stopped, using an OSC cue delayed by the length of the reverb tail. Both plug-ins fail to apply an effect to the audio. 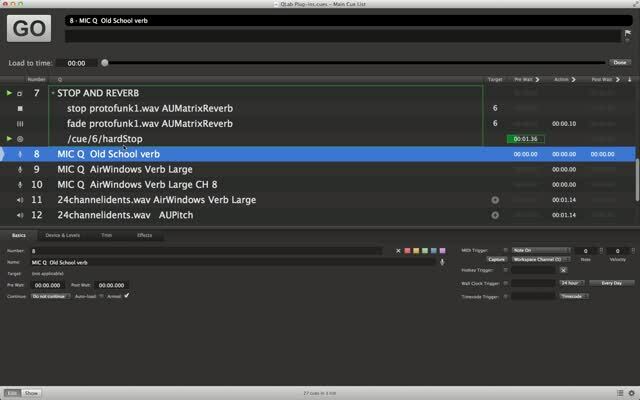 The shareware reverb passes no audio, and AUMatrixVerb just passes the original audio. This is because the effects are now presented with a multichannel input, equivalent to the number of hardware input channels on your interface. Very few reverb plug-ins will work in this configuration, which is unfortunate, as putting some reverb on a mic is a common use for QLab’s audio effects feature. With a 2 input interface these plug-ins both work as expected. This variation between interfaces is the cause of some confusion. One user may recommend a plug-in that another user can’t get to work, all because they are using interfaces with different numbers of input channels. If you need to use all your mic inputs you can get a mono reverb using these settings. Generally, if a plug-in will work with a given number of physical inputs on an interface with a microphone cue, it will also work with an interleaved audio file, with an equivalent number of tracks. 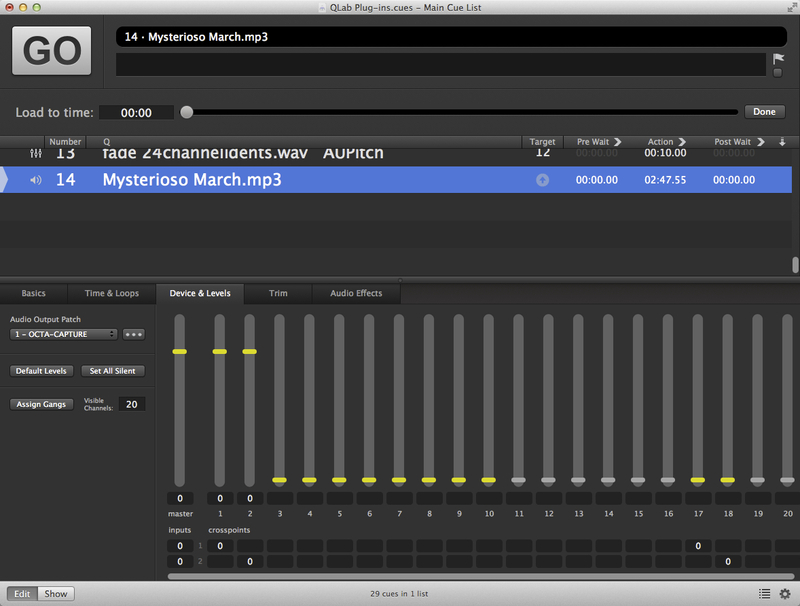 Plug-ins can, therefore, be tested easily using multitrack audio files. You can download a set created for this purpose here. The files consist of spoken channel number idents on each track. They are intended to be looped. 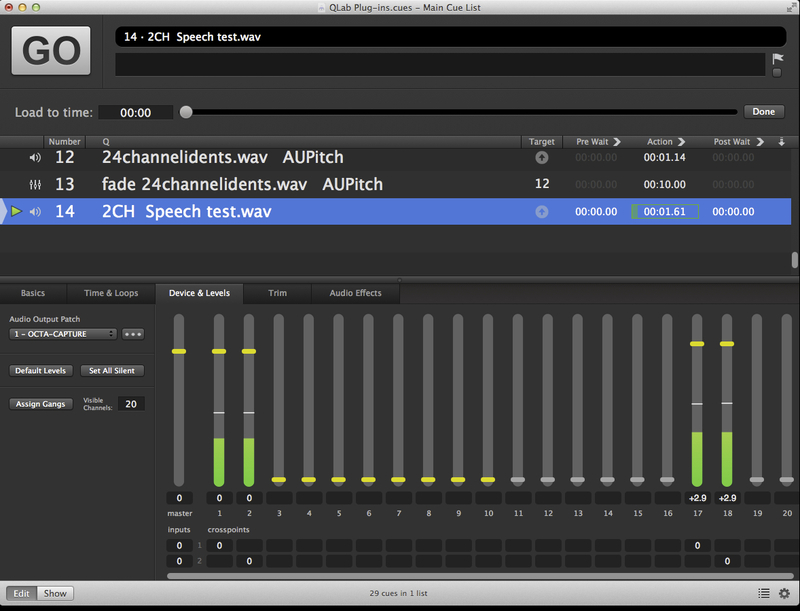 EXAMPLE 9: CUES Using AUPitch and Effects Fades. 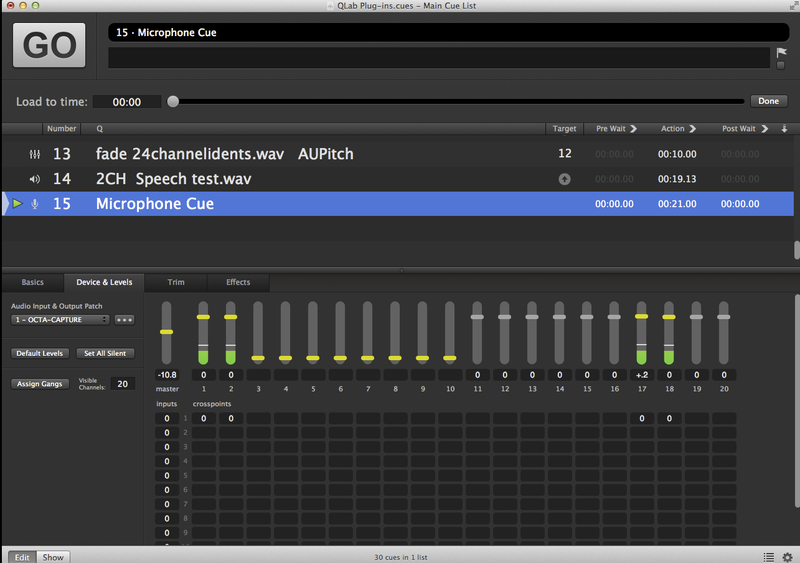 Tracks 1 and 24 of a 24 ch interleaved wav are audible, with an AU pitch shift plug-in on the cue audio effects tab. When the fade is triggered the pitch parameter of the plug-in is faded to a new value, and the matrix crossfades, reversing the sides of the 1 and 24 track announcements. 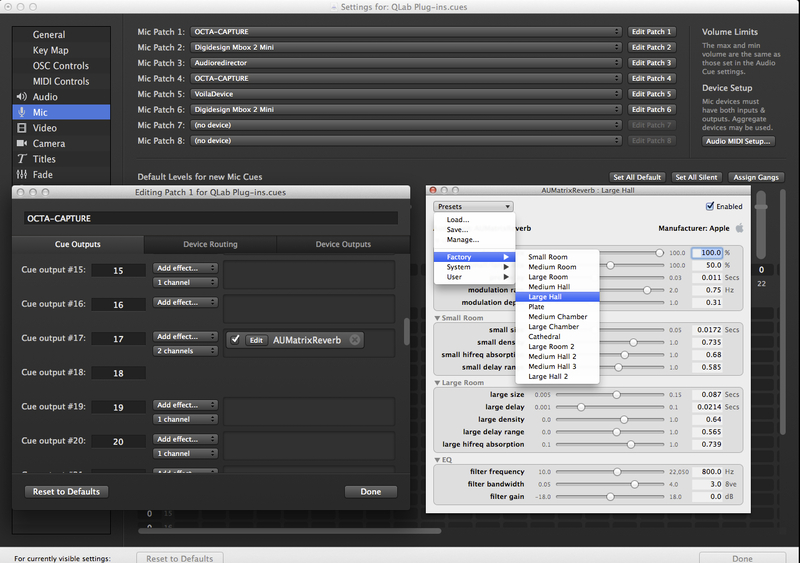 Plug-ins may not report their tail times, and may cut abruptly, or not release the cues without being explicitly hard stopped, either with a double ESC, or an OSC hardStop cue. Plug-ins may only work with a specific number of inputs, either as interleaved tracks in an audio cue, or as inputs on a hardware interface. A cue list that includes cues with audio effects that plays perfectly on a system that uses an interface with a small number of input channels, may not play at all on a system with a more complex interface with a higher input count. Plug-ins that do not work may produce no audio output, or may just pass through the original audio unaffected. Plug-ins may be slow to load, and there may be a delay before the effect is heard on the audio cue. Meters don’t work on plug-ins inserted in cues. Many of the above problems can be avoided by inserting plug-ins on cue outputs, or on device outputs. There, they behave far more like plug-ins in a DAW, or effects on aux busses in a mixer, in so far as they are loaded when the workspace is opened and stay unchanged until the workspace is closed. 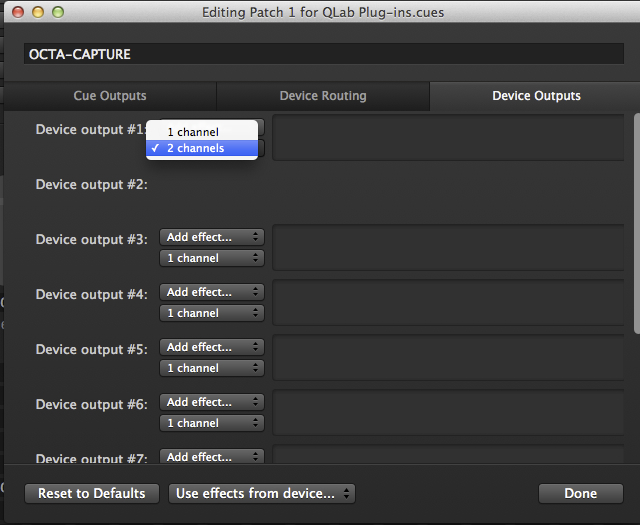 Plug-in parameters are beyond the control of QLab cues. Parameters can’t be faded or changed . So, for instance, if you need a long and short reverb, you will have to create 2 separate reverbs. The outputs of the effects are permanently live to the outputs of the system. This precludes the use of effects with, for instance, simulation of 50/60Hz mains hum, vinyl surface noise, or integral sample playback. However, one great advantage is that the meters work, so it is even possible to have spectrum analysers on output inserts, as well as having proper visual feedback when setting up multiband dynamics units, etc. On the following pages is a step by step guide to setting up the inserts, and some examples of the plug-ins in use. This example inserts a stereo reverb on some high numbered cue outputs, beyond the range of actual physical outputs in use, in this case, 17-18, and routes the output of that reverb to audio outputs. using the device matrix. 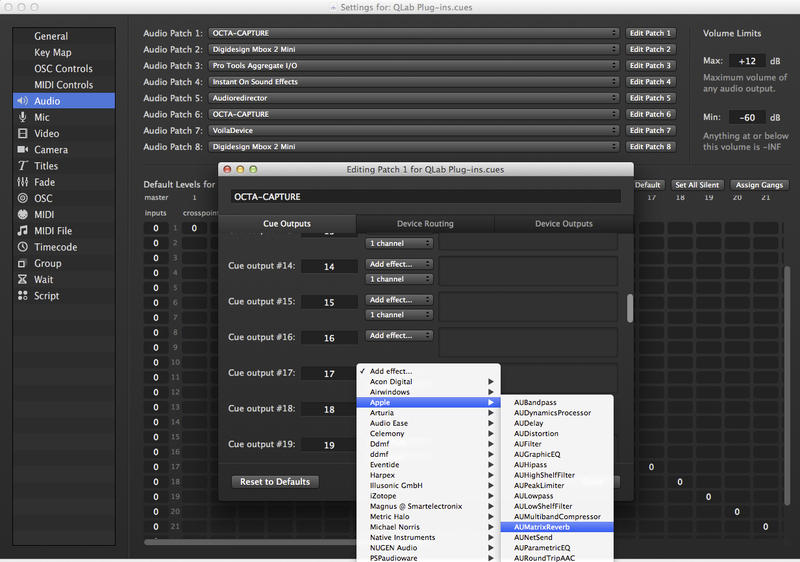 Open the Device Routing tab and matrix cue outputs 17+18 into the required audio outputs. In the example, 1+2 are used so the reverb goes to the main audio outputs. For a reverb, -20 is a good level. This creates the equivalent of a reverb return on a console or DAW. 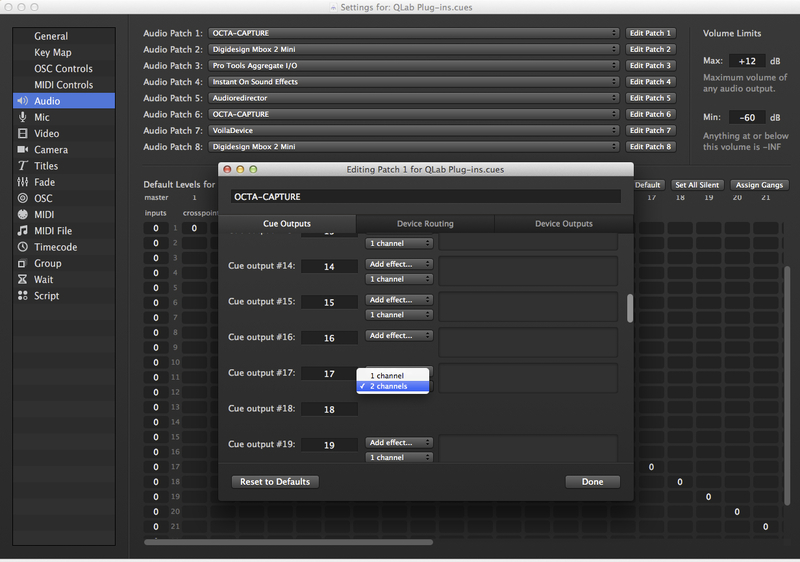 Return to the cue list and create an audio cue and matrix the cue to cue outputs 17+18. Now create a microphone cue. You will probably notice that sliders 17+18 are inactive and greyed out. This is because the patch edit for microphone cues is entirely independent of that set for audio cues. Go back to settings and click the edit patch button for the Microphone cues and repeat the steps to insert a stereo instance of AUMatrixReverb and select the preset. 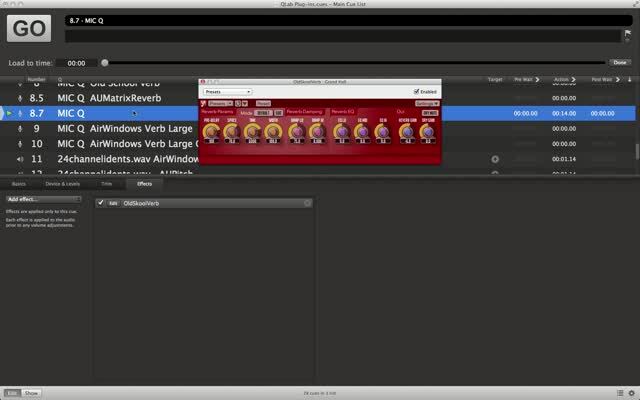 You now have functioning reverb within QLab that is free of most of the problems associated with plug-ins directly inserted on audio or microphone cues. It is often desirable to time delay certain loudspeakers on a rig. This can achieve far greater realism for performers wearing lavalier microphones, by ensuring the direct sound from the performer reaches the audience very slightly before the reinforced sound from the loudspeakers. For recorded sound, it is a very powerful tool, as it can alter the perceived location of the source of the sound. At it’s simplest it can prevent those sitting close to speakers on the proscenium arch being aware of sound coming from the loudspeaker itself. If the audio is played through the proscenium speakers and also through speakers at the rear of the stage, introducing 20ms of delay on the proscenium speakers can move their apparent position to an on-stage position while maintaining the clarity of a loudspeaker in the auditorium. 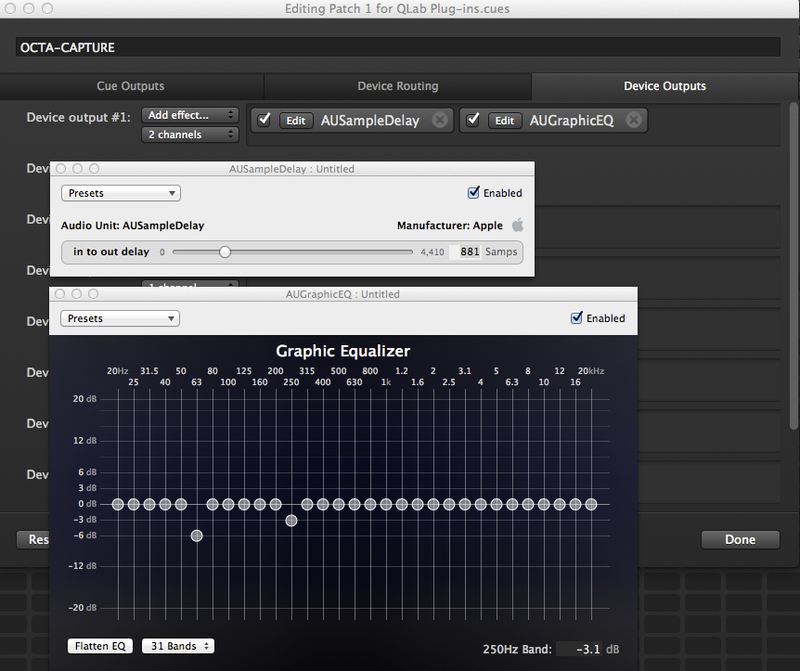 In this example, we will insert a time delay and a graphic EQ to allow delay and EQ of the loudspeaker systems connected to outputs 1+2 of our interface. Insert an Apple AUSampleDelay and an AUGraphicEQ plug-in to the device output. In our example, the sample delay is set to 882 samples which equates to 20ms of delay at 44.1KHz. On the graphic, a couple of troublesome frequencies are adjusted a little. 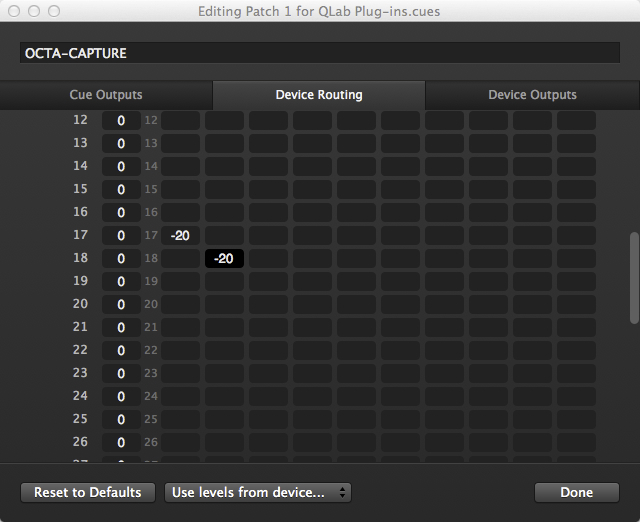 Now, all audio that comes out of outputs 1+2 of the interface will be processed by the plug-ins. Important Note: Although called device outputs, this processing is actually considerably downstream of the actual physical device outputs, so you still need to set this up for microphone cues and audio cues separately. 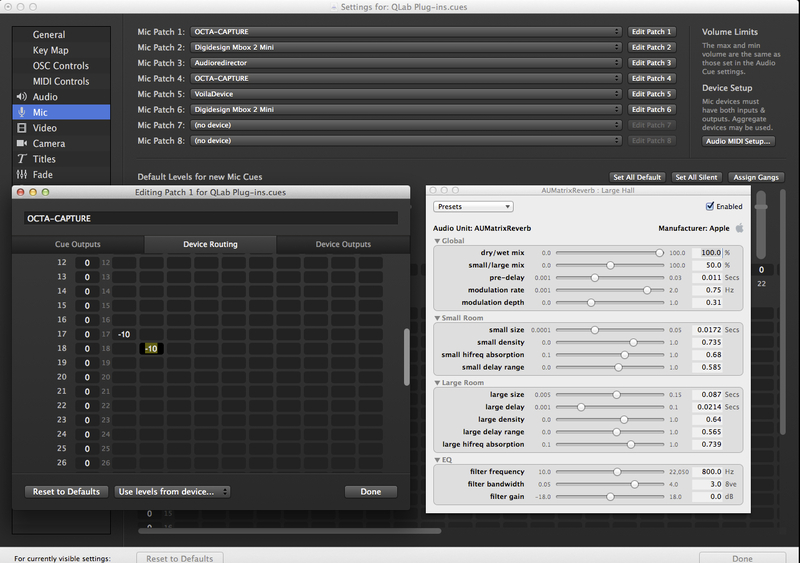 Of course, the advantage of this is that you can have completely different settings for each cue type. You can download a full bundle of this workspace with the audio here. Chapter Graphic: Original photograph By Lionel Allorge via Wikimedia Commons. Modified image distributed under the same license.